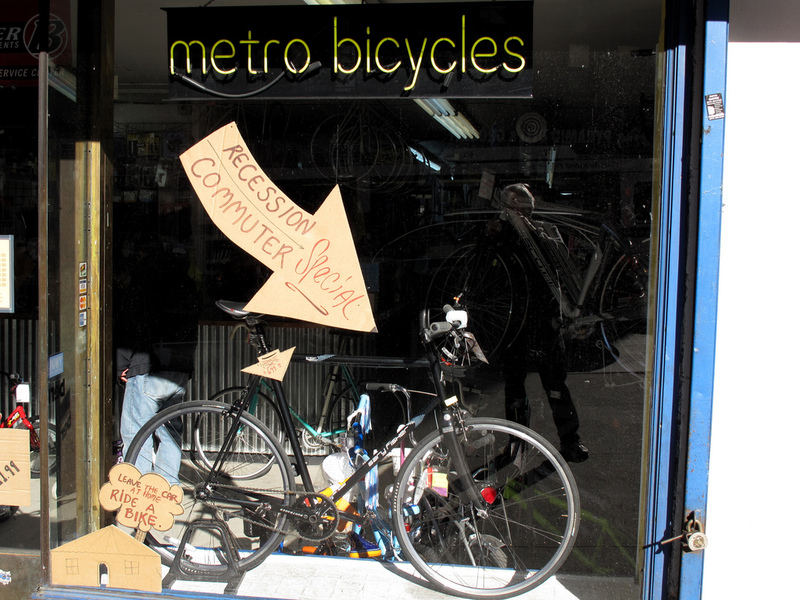 Moving through the Recession, Part 4: Can We Sustain the Biking Boom? Bicycling has seen rising popularity during the recession, but this increased interest won't be sustained without adequate investments. Photo by Ed Yourdon. This is the fourth installment of TheCityFix’s series Moving through the Recession, which explores how the worldwide economic slowdown has impacted transportation systems and users locally, nationally and internationally. Parts 1, 2 and 3 examined transit ridership, service cuts and the plight of the D.C. Metro, respectively. Be sure to check back often for updates to this series. As the recession sunk in a couple years back, bicycling was all the rage. According to the American Community Survey, the percentage of commuters traveling by bicycle increased 36% from 2005-2008, from 0.40% to 0.55% of trips. Bicycle commuting in New York City shot up 35% in 2008 and 26% in 2009, and ridership in San Francisco increased 8.3% from 2008 to 2009. U.S. bike sales were actually higher than car and truck sales in early 2009 for the first time since the 1970s. (Bike sales were hurt by the recession, just not as much as car sales.) Support for bicycle advocacy efforts was up, as was membership in bicycle clubs. The same story goes all over the world. Biking grew in Japan and Britain, and Ireland unveiled its first national cycling policy in April 2009. All this bike-mania even kicked off some fashion trends. Bike advocates came up with all sorts of reasons for this increased popularity. Cycling is a great money-saver – a cheaper commute mode than driving or even transit. It’s also good for low-cost recreation and fitness, as it’s less expensive than a gym membership. It’s a way for people to act on their concern over climate change. It works for a population increasingly interested in urban trends and lifestyles. In short, it’s become…cool. Though all of these things are true, some may be more accurate than others. We won’t know for sure until more complete data is available, but the boost in biking may have been driven more by the 2008 spike in gas prices than by the general state of the economy. As we discussed in Part 1 of Moving through the Recession, gas prices reached a high in the summer of 2008. And as it turns out, bike sales skyrocketed along with them. However, business and ridership have not necessarily kept pace since then. Of course, there are a lot of factors that go into bike ridership, with weather and seasonal fluctuations being no small matter. But a pattern of bike use following gas prices makes sense historically – it happened in the 1970s (see graphic below) – and complements trends we’ve seen in transit ridership and driving. And a lot of us accept the conventional wisdom that people will change their behavior most drastically when they’re feeling it in their wallet. Bicycle sales surpassed car sales in 2009 for the first time since the 1970s. Graphic: NY Times. To address climate change, public health and livability issues, we want to keep as many of those new riders as possible, and attract more. This is not unlikely. Even if high gas prices – or the recession, in general – was the impetus for a cycling boost, people may want to continue the healthy lifestyle they’ve now experienced. The heightened interest we saw these past couple years may have been just enough to push bicycling into the mainstream. Cycling’s new accessibility and trendiness may have started the sort of cultural change needed to make it a real option for more people. In any case, if we want to continue that cultural change, we need to make cycling safer, more convenient and easier. In other words, we need to invest in bicycle infrastructure. In the short term, this investment will protect all those new cyclists – the recent rise in British cyclist deaths has illustrated the serious need for this – and provide a smart means of economic recovery. In the longer term, it will help prepare us for future gas price hikes and address the environmental and livability challenges we will continue to confront. Federal, state and city governments have made some strides in this respect. The recently-announced U.S. TIGER grants funded 16 projects with bicycling components (out of a total of 51.) Dozens more applied and some will hopefully receive money through future rounds of grants. New York City has increased its bike network significantly in the past year (maybe one reason why its gains in ridership were more or less sustained from 2008 to 2009). Washington, D.C. is planning an expanded network of dedicated bicycle lanes, and hopes to install some before the summer biking season. And Portland, Ore. is pushing forward with its Bicycle Plan for 2030, having just proposed an interesting way to fund it and improve the sewer system at the same time. At the same time, cities from Mexico City to Mumbai are experimenting with bikesharing programs and car-free days. As we’ve stated before, recession’s true impact on transportation won’t be totally clear for years. But our Moving through the Recession series is pointing to one lesson: that making strides on the sustainable transportation front will require higher gas prices. Policymakers must learn from the great experiment of the 2008 price spike, which accompanied reduced driving, increased use of transit, more walking and biking, and the curbing of sprawl. As they begin work on the next transportation reauthorization and the development of new funding options here in the U.S., Congress cannot ignore all these positive results for our quality of life and our environment.